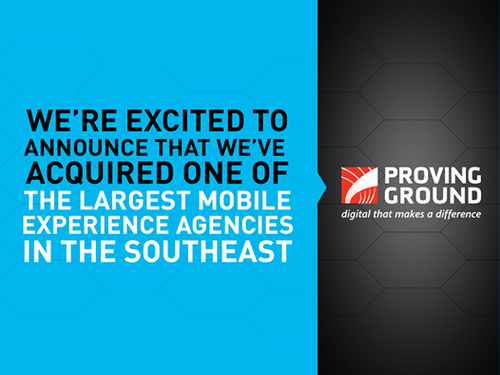 In the novel Ender’s Game, Colonel Graff said it best when he told Ender, “We’re doing something unusual with Dragon Army.” As you can see in the title, Dragon Army is proud to announce we’ve acquired Proving Ground, one of the leading mobile agencies in the Southeast. studio joining forces with a mobile development agency might seem…well, unusual. Over the past year, we’ve met with a wide range of companies and have found that a singular underlying problem exists. Businesses are finding it increasingly difficult to create deeper audience engagement with their digital experiences. This isn’t the first time Davis and Hilimire have worked together. In 1998, they launched digital agency Spunlogic, which eventually sold to Engauge then Publicis (combined under the Moxie name). While the merger of a gaming studio and mobile agency on the surface might seem a bit unusual, at its core our two companies will be better poised to meet the ever changing world of mobile experiences. Learn more about the Proving Ground acquisition and the future of Dragon Army in our press release.